How to get to Tree Farm! From Interstate 91, Exit 7: take Route 11 west for 3 miles until you come to a traffic signal at Bridge Street (you will see the Southern Vermont Recreation Center on the northwest corner of this 3 way intersection). Turn right and continue for about 1/2 mile to the stop sign at the top of the hill. Turn right on Skitchewaug Trail (Route 143) and continue for 0.4 mile, the campground entrance is on the right. NOTE: Do Not Make a RIGHT onto Park Ridge Road, Ignore your GPS! 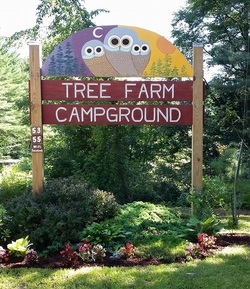 ​Continue on RTE 143 until you see the OWLS of the Tree Farm Campground!! Feel free to give us a call at (802) 885-2889 if you have any questions or if you have trouble finding us!